Ultra-high mileage coupled with Metzeler performance and handling. 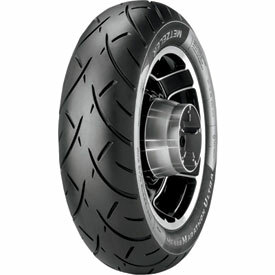 One of the best tires you can buy for your bike in my opinion. I own a bike shop and I put alot of tires on and I also ride alot. I have tried almost every other brand of tire but always come back to the 888. I’ve been putting these tires on for years. They have good grip without given up mileage. Not just a great touring tire, its a great tire! I've been looking for a Wide Whitewall replacement for the factory Dunlops on my 2015 Harley Heritage. I've only gotten a little over 10k miles from my first two factory Dunlop rear tires and I'm NOT an aggressive rider. Since I am only replacing the rear tire at this time, I was very concerned the width of the whitewall on the 888 would be noticeable different than my factory front tire. I was very happy when I received the tire and the whitewalls measured exactly the same. I bought this tire based on reviews suggesting I should get much longer wear than my prior experiences. At this point, this review is based on cosmetics and RM's service and pricing... "fingers crossed" for a long wearing tire. Just put full set of ultra 888 on my bike. The rear tire is much more round on the tread for better handling than my stock Dunlap s . I run loaded very heavy so I keep my rear tire at 40 psi. I had no problems with the high winds and rain with a trip to Nevada from Colorado and back. Outside temps varied from the 40's to 90's with ground temps being much higher. This is the first time I have purchased metzler tire and would say these are much better tires than the bridgestones that I replaced would buy again. Hugs the road, hugs the curves. Just put them on so I can’t tell you how long they’ll last. So far, so good. Smother, quieter and better ride than the Dunlops. Only ever had stock OEM tires on any of my bikes, letting the dealership replace the tires under warranty with their own the last time. This time, decided to try something different, and went with the Metlzer's based on the recommendations of a number of fellow riders. I am very thankful I did! These ride so much better, I don't find road snake tracking to be an issue any longer; they handle bends and cornering like a dream, and they grip the road like glue. Used to be nervous about taking bends at speed, but now?? Not an issue! I've encountered no issue with wet road surfaces so far, but I only road through 10 miles of drizzles and kept the speed around 50, so not a great test per se. I've put only about 150 miles on them since they were installed this past weekend, so I have no way of knowing the quality of tread life. New tread was .312". Put 4500 miles on it so far. Used .100". Looks like it will last for 9,000 miles. Original Dunlop 402 lasted for 11,500 miles. Much softer feeling ride. Works well. First time with metzler. been using recommended Dunlops for years on my 2001 harley Ultra classic. I should have switched long ago. I really like the ride. They seem to really grip the road. The only reason i gave the tires a 3 out of 5 on tread life and wet traction is that i havent had them long enough to give a rating. The true test will be to see how long they last. I would only get 8000 to 10k on the dunlops. I heard that the metzlers would give 14k I have not ridden in the rain with them yet. I also like the great prices of these. A lot cheaper than dunlops. I would recommend. Also i ordered by phone and the salesman was very good. He even helped and sent in the rebate that Metzler was offering. Also did a price match with another company. Will definitely work with these guys again! Thanks! This is my second purchase of ME888's bought a set for my Harley wide glide and now a set for my Indian scout. I can honestly tell you the work fantastic in the Washington rain and do awesome in the dead heat of Texas. I wouldn't go with any other tire for my bikes. These were mounted for a Utah to Alaska round trip. That trip was 3 years ago and they are still going with over 14k on the clock. I pulled a small trailer that was well loaded. They worked fine on street, gravel and at times mud! 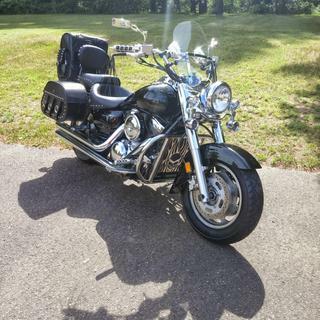 My bike is an 800cc mid size Suzuki C-50 Boulevard cruiser. 42k miles total on my bike. Just put these on my 2016 1700 Kawasaki Touring bike , handling is great hope to get the miles out of them. Great handling tire, easy turning, if you push your bike to the extreme limits on down shifting or high speed tight turn , you'll feel a little slip, but hooks right up . I love the tire . Dump the clutch wide open , it'll spin slightly but then grips super. Awesome tires. This will be my second rear met 888 tire installed on my 2011 HD Road Glide. I got 14k miles with the 1st rear tire installed. My front tire is also a met 888. Weather on dry or wet roads, these tires handle great and you get good bang for your buck on tire wear mileage. 2007 Ultra Classic The Dunlop rear tires got 7500-8000 miles.This tire got 16000. Love this tire. Glad I called Rocky mountain for advice!!!!! We installed the Metzeler 888's on a GL1800. I really like the way the tires hook up with the road. This is a great tire in the rain or riding in Death Valley at 120F or 45C. Only complaint is the tire is noisy, sort of like riding next to a transport truck so use earplugs. We have tried Avon Cobras then the Venom and had to take them off as the tires would slide in the rain on easy cornering and when riding two up and the bike slides I would have an unwanted crease in the seat. Even when throttling up on a straight away when crossing over newer pavement on the way to Hyder AK the tire would spin. On a nutshell I would highly recommend the 888's. I was excited to get these so called high mileage tires on. i replaced the rear tire 1st, then the front. the front tire is extremely noisy! The rear has worn out at 10,000 miles. i got 11,000 out of the dunlop elite 3's that came on it! i will not buy metzeler again. Very Very disappointed in the wear life and noise! I use balance beads, and they work great, but did nothing to help the noise or poor tire wear! Rocky Mtn was great!!!!! i will continue to buy from them. Since making the switch to the 880s a couple years back, I have always replaced my tires with metzelers. Improves grip especially around corners. Can't believe how fast it was shipped, Only took two days. Fit perfect, love the looks. Now to see what kind of service I get out of it. Best tire ever. Works perfect all the way to the cords! I only have 2-3K on these so far and so far, they don't show hardly any wear. The tires roll into turns effortlessly and stick like glue. Even in the rain, they seem to leave a dry patch for all the water they moved. Handling is fantastic, they grip the pavement very well wet or dry, increasing my sense of confidence with every turn. The ride is smooth and quiet. If I get near the 20K I got out of my OEW Dunlops I'll be thrilled though the difference in handling, smoothness and noise, I might be ok with 2/3 the mileage. I bought this tire because I thought it would last longer. WRONG! At 7200 miles the cord was showing. What's worse is there was no indication I was down that far. There are no wear indicators and it starts with almost no tread in the center so you almost have to wait until cords show! Now I have to trailer it to have the tire replaced because I certainly won't drive it with cords showing. 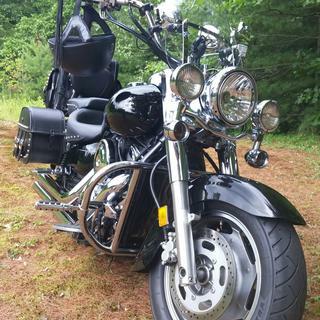 The bike is a Harley Heritage Softail Classic driven by a 65 year old man mostly on long straight roads. Going back to the Dunlop. like the title says so far so good. tire handles really well and was easy to mount. hard to beat the price. 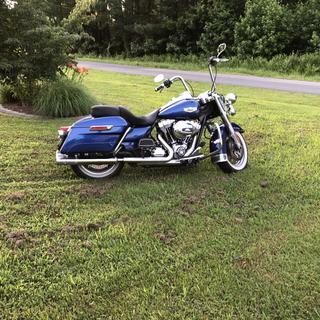 I am looking for white wall tires for a 2001 Kawasaki nomad 1550g.do you have a set? BEST ANSWER: What sizes are you wanting? Once we have this information we will be able to further assist you.